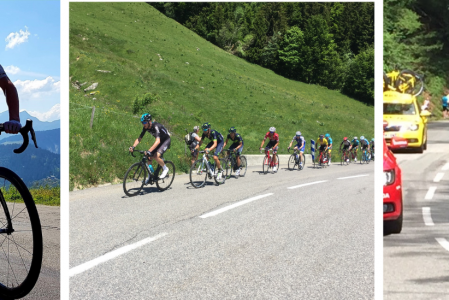 The Criterium du Dauphine (9th - 16th June 2019) is an ideal opportunity to combine an alpine cycling holiday with watching the very best riders take part in the 2019 Criterium de Dauphine. Based in the Tarentaise resorts of Meribel and La Tania, the first part of the holiday gives you the opportunity to take part in daily local rides. All rides are paced to ensure everyone works within their capabilities and goals. The second part of the week combines daily rides with the opportunity to join the Criterium as a spectator; soak up the atmosphere and cheer the riders on! The trip and route will be confirmed once the 2019 race details are released in March 2019. Our transfers operate in and out of Geneva Airport. Inbound flights should land at Geneva no later than 13:30 in order to meet the transfer to resort. Outbound flights should depart Geneva no earlier than 13:30. Please let us know if these timings present a problem for you prior to booking. Bringing your own bike out to the Alps is easy. You'll need a bike box to transport your bike. If you don't have one, they can be rented via http://www.bikebox-rental.co.uk/. You will need to remove the pedals and the handlebars, and then turn them so they are by your forks. Easyjet, Swiss and BA offer cost effective bike carriage (around €50) and you can pack other belongings in with your bike, working within the allowed weight limits. If you would prefer to rent a bike locally, please let us know at the time of booking and we can provide you with some quotes. Travel insurance is not included in the price of your holiday. Please ensure that you have adequate insurance in place prior to booking your holiday with us.